I found your article on the Media very interesting. ( GROUPTHINK: The Disastrous Power Elite Tunnel Vision, to Which a Population Is Indoctrinated ). Here in Scotland, a country under the occupation of its powerful neighbour England for the last 304 years is subjected to a media indoctrination at the hands of the BBC. There is large support for independence in Scotland however the BBC goes out of its way not to report the truth about politics and the Scottish economy. The best way i can explain what i mean is posting the bellow links to one of the few sites that tries to print the truth. I feel international exposure of the BBC tactics in Scotland would go along way to helping the cause for Scottish independence. Then we would be able to bring our troops home from the illegal wars of the British and US Governments. These are just two of the articles which display what is going on in Scotland. I am very pleased that you have placed Helen Thomas on your newspaper. It was a brave and wonderful move in the right direction. To stop Helen, would make this a country into a country with the loss of Freedom of Speech. Many professionals speaking out correctly on Israel have lost their jobs. As to the pro-Israeli people who write in with a biased attempt to make Israel look good, and Helen, a long term professional journalist, "bad," many are misguided or wrong about historical facts. The Palestinians have been in Palestine for eons, just as the Jews have been. Further, they got along. When Israel was set up as a state, it was within territories that belonged to Palestinian Arabs for centuries. Israel fought for even more, and took more land. Many Arabs still have their deeds and the keys to their former homes, though they cannot have their homes back, yet anyone Jewish can live in these stolen homes and vineyards. Israel has sophisticated war equipment sent to it by the United States which it uses against its neighbors. And we send three billion plus each year of American money to Israel. But this is only furthering the evil attacks that Israel commits against innocent women and children. Since the start of this state, there has been no peace. Israel commits war crimes each and every day against the Palestinian people, and further, she constantly gets away with going against international law. The United States only makes feeble attempts to create peace in the Middle East, while Israel creates her own reality, and it is not to make peace with her neighbors. Helen Thomas is a professional, a journalist, and has served many Presidents faithfully. She is well acquainted with the truth about the Middle East. And that is why she spoke out. Each of us knows personally Palestinians who were ousted from their homes overnight. I read this article written by Mr. Hanna Kawas. I want to add one more thing that those people defending Israel may be from this category which is mentioned in the Guardian on November 28th, 2010 to recruit advocates for Israel in European countries. I wonder those advocates here in Canada are the same category. Establishment news media bears the primary responsibility for Islamophobia. Had they been doing there job, Americans would not be so easily manipulated. Whether it is the war in Iraq or Afghanistan, the ravages caused by US covert actions, or the tragic events of September 11, 2001, establishment news media has failed to give us timely, truthful and balanced accounts. Take 9/11 -- arguably the biggest driver of Islamophobia, how many Americans know that 2000+ engineers, architects, military and intelligence personnel, scientists, pilots, and professors do not believe the official account of 9/11? This opposition to the official account is unprecendented. Yet establishment news media have failed to report this, and to inquire why the official account is so discredited in both the US and overseas. Of course, others -- particularly Muslim leaders, are not blameless. If you're interested in getting to the truth about 9/11, I suggest beginning with this account of what happened at the Pentagon. South Africa established separate education systems for Blacks, Whites and Coloreds. Non-white education systems were seriously underfunded. 1984 per capita spending on white children was 1,654 SAR, black children 234 SAR. Israel has established separate Hebrew and Arab education systems. 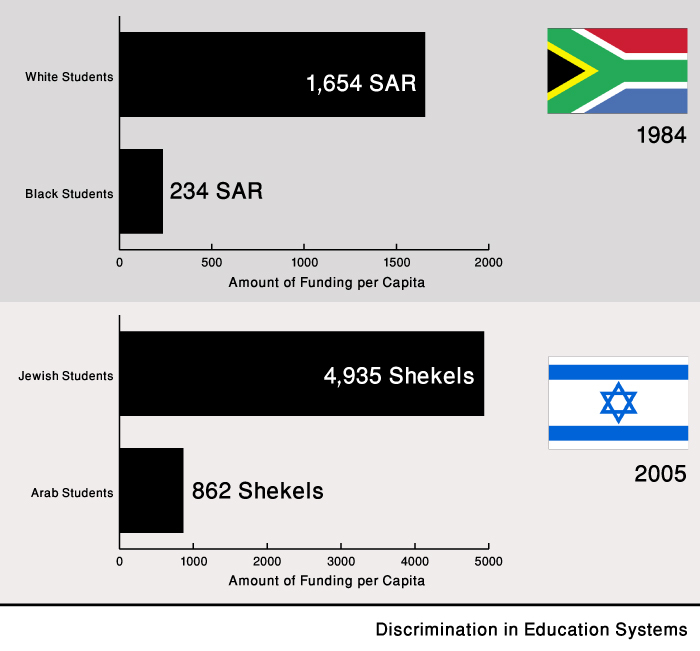 A 2005 study showed that within Israel, Jewish students receive 4,935 Israeli Shekels per year in education funding while Arab students receive 862. Talking about Israel, Nazism, comparisons, German guilt and multiculturalism.. It is almost amusing to hear Philips dismissing Hasbara (Israeli propaganda) in Britain. It is also very cheering to learn from rabid Zionist Philips that in spite of the Israeli Lobby, David Aaronovitch, Nick Cohen and herself, the Palestinians are winning the hearts and minds of British public. I guess that it is about time Philips gathers the fact that humanism may win after all. http://cpavancouver.org/radio.html Voice of Palestine will be interviewing Richard Forer http://www.richardforer.com Tuesday evening Jan. 25, 2011 between 8:00-9:00 pm (PST). We will talk with Richard about the Albuquerque-based Coalition to Stop $30 Billion to Israel and his trip to Israel and Palestine this past summer. He is a former AIPAC member who "was completely transformed as a result of a spiritual awakening in the summer of 2006", and has just put out a new book Breakthrough: Transforming Fear into Compassion - A New Perspective on the Israel-Palestine Conflict http://www.richardforer.com/the-book/. Valley of the Wolves: Palestine is a new Turkish movie portraying the Mavi Marmara massacre as a premeditated Israeli attack that was set to kill innocent peace activists. An uproar has erupted in Germany in the last few days over the upcoming launching of the film. The film's intended release date in Germany is January 27, the same day as the International Holocaust Remembrance Day. Apparently the German distributor of the film confirmed that the company had been unaware of the sensitivity of the date. However, I actually think that linking between the events is not such a bad idea. If the International Holocaust Remembrance Day is there to remind us of crimes committed by a racist ethno-centric regime in the past, the Turkish film is there to awaken us to the colossal crimes that are committed by a racist ethno-centric regime in the present. If Germans are genuinely interested in the Nazi past, they better look closely at Israeli current brutality. Two young journalists found themselves in the middle of what would be their biggest story yet, but what happened would change their lives forever. 365 AM is the raw story of Gaza and two journalists trying to reach the rest of the world from inside one of the most deeply divided and silenced places on the globe. 1- we seek to show and educate the Western audience about a different narrative than the one they are used to seeing about the people in Gaza. 2- we intend on entering this film into many film festivals around the world. 3- we will create a website that will empower people to take action giving them a set of practical steps that they can take to help the people of Gaza. 4- we hope to do a speaking tour around the world with Ayman Mohyeldin and Sherine Tadros targeting the Universities, and other educational and prominent institutions to shed light on what happend in Gaza.